I tend to write about things that come to me at some point during the day that requires some reflective thought. I have no agenda other than doing what I can to help those who are suffering with things that I have gone through myself. I will not provide advice, only information that I believe may help others to better understand themselves. I spend time thinking through the questions that I ask myself, have logical arguments in my mind and draw conclusions. An intelligent friend of mine said something to me a while back that resonated with me, and during some deep thought on anxiety and depression, I put some concepts together that I would like to share. He said to me, "There are two parts to life, the first half and the second half, but we don't realize this until we are well into the second half." It may not sound like a profound statement if you are not in the second half of life, but it made complete sense to me. The first half of life we spend much of our time looking into the future and trying to determine what it could look like. We then spend the second half of our lives remembering and reflecting on our past. What this simple realization did for me was put anxiety and depression into a different light. 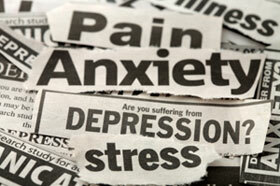 Anxiety comes from fear of future events whereas depression comes from unresolved issues in our past. I see many articles where anxiety and depression are talked about together, yet they are polar opposites. In my opinion, they are linked together not because the symptoms are the same, but because the treatments can be quite similar for both. I am huge fan of Eckhart Tolle who is a very enlightened man who has written books explained how to live in the "now". The treatments needed for anxiety and depression try to bring us back to the present moment, or the 'now' so that we can deal with our past or future here in this moment. A profound statement is 'we only have the present moment, the rest only exists in our mind'. We live a lifetime of present moments in this reality but spend most of our time letting our minds take us to the past and future. The past is gone and we can not change it. The future can not be predicted so any image we create in our mind is simply our brain trying to base possibilities of future events on how we are feeling at the present moment. I hope this doesn't sound confusing but I do understand that it can be a confusing concept. I am sharing this thought process to give you a slightly better understanding of why we are so affected by anxiety and depression. They are very real afflictions, and they can be absolutely crippling at times. Anxiety comes from our most primal of instincts in relation to our mind. We think about something that 'could' happen, and we have a fight or flight response in our body in reaction to that thought. We create fears within ourselves that can bring up a response of anxiety or panic, yet these are not problems in reality, only created inside our brain. Removing these fears within ourselves will reduce the anxiety and panic. This is not an easy process but anxiety can be overcome by learning to control our fears. For now I suggest to start with one smaller fear at a time, and as your confidence grows, start to tackle the larger ones. Quiet reflection and meditation are the best and safest places to get started. As for depression, this comes from our minds being constantly dragged into the past because we have unresolved issues that our brain has still not made sense of, so we are left in negative or depressed state until we resolve it. The more unresolved issues we have, the more depressed we become. I realize that dealing with depression is a very difficult process and I do not mean to make it sound simplistic in any way because it is a horrible thing to have to live with. Understanding these statements will help you to realize that you do have unresolved issues, and if you don't begin to resolve them, your state of mind will never truly improve. When we are focused on negative thinking our lives become negative as well. It is the same for depression as it is for anxiety; you need to begin dealing with these issues one at a time. Don't be afraid to ask for help from those that you trust if you are too far down to start on your own. There are highly educated and experienced mental health workers out there that can help you get started in a safe environment. If you are stubborn like I am and have difficult asking for help, then I suggest working on these unresolved issues only when you are in a good state of mind. Take one issue at a time and slowly try to focus on it, and ask yourself why it is still bothering. Continue to ask why and other questions until you get some answers. If it begins to put you in a more negative state of mind, put it aside until you are having a better moment. We need inner strength to resolve these issues and your strength will increase the more you try. Become the master of your own mind and learn how to bring yourself back to the present moment. Become mindful of everything around you so you feel more grounded throughout the day. Find some quiet time each day to work on yourself without distraction, You deserve the self care required to solve your issues, so take it when you can. Baby steps lead to giant leaps eventually. You won't fix your issues over night and it could be long process, but you are worth the effort. You matter, your life matters and peace is your right. If you want inner peace, start taking steps to find it. Your journey to happiness has to start somewhere. Can Addictions and Mental Illness Be Prevented?